Living Free Animal Sanctuary has created a comprehensive, multi-prong plan that makes it possible to see all shelters in the United States be no-kill shelters by 2020. Living Free Animal Sanctuary has created a comprehensive, multi-prong plan that makes it possible to see all shelters in the United States be no-kill shelters by 2020. Of the four components, Direct Action, Collaboration, Outreach and Education, and Legislative and Policy Changes, the fourth piece is critical to shift legal, bureaucratic and economic incentives to help prevent, rather than encourage, the killing of healthy adoptable animals in shelters. Encourage regulations requiring licensing and periodic inspections for all breeders, including unqualified “backyard breeders”, with severe penalties for violators (especially repeat violators). Two additional pieces of information add clarification. First, as some shelters are managed by private contractors and others by either city or county employees, it is important to make sure there are no exceptions to any legislation or policy because of their current administration structure. Secondly, there is no need to target responsible breeders as, by definition, they are low volume. This is targeting the high volume mill breeders. Many are in Missouri or the Amish Country in Pennsylvania, but they ship pets all over the country. If interstate transportation of kittens and puppies can be eliminated from those states alone, much of this particular issue will be resolved. The solution is in better management, policies, and incentives in shelters – all of which can be driven to change by public alliance behind a common and attainable goal. In moving forward to see significant changes taking place on the local, county, state, and federal levels, there must be an understanding of some of the myths verses the realities with regard to facility management, the crux of this piece of the plan. MYTH: Kill shelters always do their best to place animals in adoptive homes, and only kill animals when they are overcrowded. REALITY: Many shelters are managed by private businesses under government contract. In many cases, revenue is based on animals taken in from the public. Once a shelter is at capacity, turnover is required to generate more income. If an animal is not adopted, euthanasia is the only option to allow for turnover. This business/ incentive structure needs to change. Often shelters must only report “outcomes” to fulfill their contracts. Whether they return a pet to his/her owner, find them a new home, allow a no-kill rescue group to them, or kill them, it is an “outcome”, and all are compensated the same. In short, there is no clear incentive for them to find animals new homes over killing them. And killing them involves less work than finding them homes. SOLUTION: The INCENTIVE system/ policy needs to be analyzed and changed to reward lifesaving placement efforts and penalize needless killings. MYTH: Cute, young, well-behaved, loving animals stand a better chance at shelters. REALITY: Generally, stray animals are given some time (a few days) to allow owner recovery and/or adoption, depending on the shelter management/ volume/ policies. They are killed when their time is up, regardless of “adoptability”. REALITY: If an animal is “owner surrendered” the owner signs a contract allowing the animal to be killed immediately – and they often are. 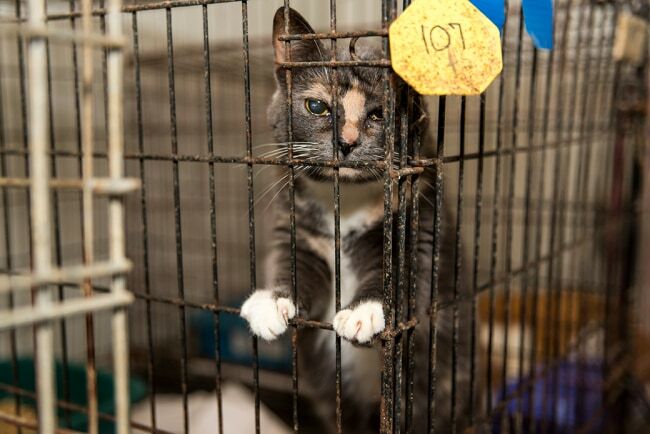 REALITY: Young puppies and kittens are often the first to be killed in shelters. Their undeveloped immune systems make them susceptible for infectious diseases, which are expensive to treat and can spread to other animals. SOLUTION: Encourage owners who would abandon their animals at shelters to find alternative solutions, including training on specific behavioral problems; suggesting rehoming the animal with a foster or with friends and family; and providing a list of pet-friendly housing in their area. (Behavior problems and moving to places that don’t allow pets are two primary reasons otherwise healthy animals are surrendered to shelters). MYTH: Animals in shelters are there because they are undesirable in some way, and/ or have inherent behavioral or health problems. REALITY: Most shelter animals have the potential to be wonderful pets, and adapt very quickly to a safe environment and kind treatment. REALITY: Any animal thrust into in confusing, confined, unfamiliar circumstances will show signs of stress and other behavioral issues. Put yourself in their shoes. At Living Free, we see “unadoptable” animals become awesome pets when provided a little peace, space, proper attention and reasonable care. It just takes time and patience. Animal problems are more often than not actually human problems. REALITY: Many shelter animals are perfectly normal and are dropped at the shelter by irresponsible owners for various self-serving reasons having nothing to do with the animal. REALITY: About 25% of dogs in shelters are purebred, and there are purebred rescues for virtually every breed. REALITY: Puppy and kitty mill animals sold in pet stores are often inbred and raised in abnormal conditions that cause far worse health, socialization and behavioral problems than many animals adopted from shelters and rescues. SOLUTION: Legislation – Encourage legislation prohibiting the sale of animals from commercial breeders in pet stores, and enforce existing animal cruelty laws to discourage irresponsible backyard and commercial breeders from running inhumane animal mills. Develop new laws with stiffer penalties (as the FBI has recently done) that have severe penalties for recidivism. Currently, a lot of commercial breeders simply pay a fine and move their operation to another jurisdiction to avoid major penalties for repeat offenders. These actions go hand-in-hand with the other components key to the Almost Home 2020 Initiative and it will take all four pieces to see this become a reality. It can be done, but it needs the active, engaged support of every individual, group, rescue, businesses, and any and everyone who cares about the health and well-being of animals located in high-kill shelters. It is always easy to wait for someone else to do something, but this is the time and place to make change. Answer the call to action and see what you can do to see this become a reality. Additional information about the Almost Home 2020 Initiative can be found in the related articles in the series, Living Free’s Almost Home 2020 Initiative: Step One is Direct Action, Almost Home 2020 Initiative: Step 2 is Collaboration, and Almost Home 2020 Initiative: Step 3 is Outreach and Education.